The Detroit Lions have been to the playoffs twice in the previous 15 seasons. However, under coach Jim Caldwell, they made the playoffs in 2014 and look to build on their momentum. Unfotunately, the team lost two key pieces to the defense in DT Ndamukong Suh and DT Nick Fairley. 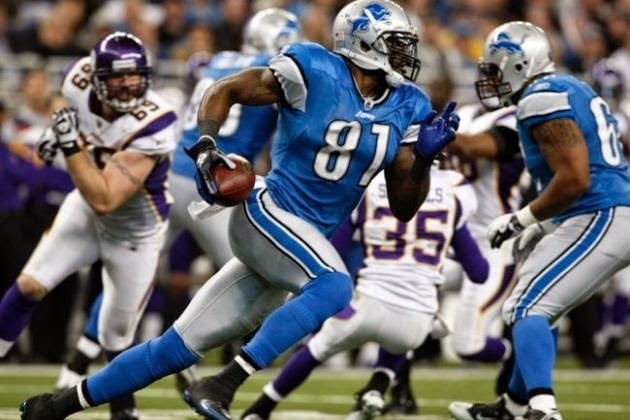 They did bring in Haloti Ngata and Tyrunn Walker to soften the blow, but we still think the Lions may take a step back. In fantasy circles, the Lions have all the pieces in place to really good. Stafford, Bell, C.Johnson, and Tate should all have nice seasons, and A.Abdullah is a sleeper at RB. W expect the Lions to finish around .500 in 2015. Key losses: RB Reggie Bush, FB Jed Collins, OT Corey Hilliard, G Rob Sims, C Dominic Raiola, DE George Johnson, DT Ndamukong Suh, DT Nick Fairley, DT C.J. Mosley, DT Andre Fluellen, OLB Ashlee Palmer, CB Cassius Vaughn. Matthew Stafford and Joe Lombardi are now a full year into their relationship together, and we feel this will bring good things in Detroit. We have Stafford as a sneaky pick to put up numbers close to Drew Brees circa 2012 as long as Megatron stays healthy. Despite a schedule including Seattle, St. Louis, and Denver, we see the Lions putting together some fine fantasy performances in 2015. The Lions defense was an excellent unit in 2015. They ranked 2nd in the league in yards allowed per game and 3rd in points allowed. We expect similar production even without Suh and Fairly, but Detroit plays a high scoring schedule,n so we feel a slight drop is coming. Look for DeAndre Levy and Stephen Tulloch to put up solid tackle numbers and watch for Ansah to produce solidly at defensive end.